Institut für Luft- und Weltraumrecht: Master of Laws (LL.M) "Public, Air and Space Law"
"Public, Air and Space Law"
Since 2017, the University of Cologne has been offering a two-semester master's degree course for lawyers who have graduated abroad, inter alia with an emphasis on "state law, air law and space law". 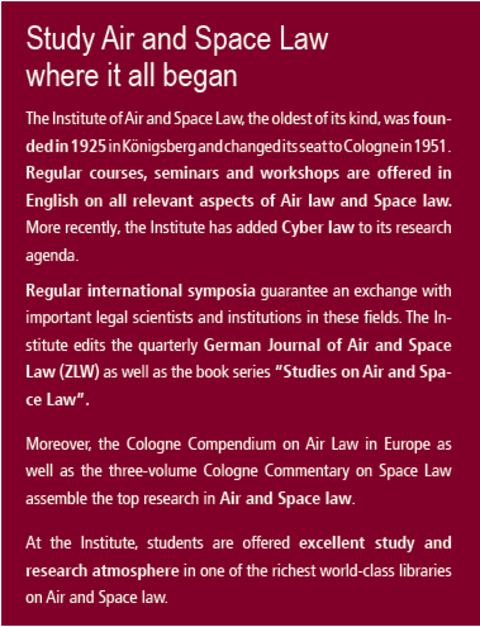 The purpose of this postgraduate programme is to familiarise students, who have already successfully obtained a law degree abroad, with German law and to equip them with a specialisation in particular areas of international public and private law, European law with a main focus on Air Law and Space Law. 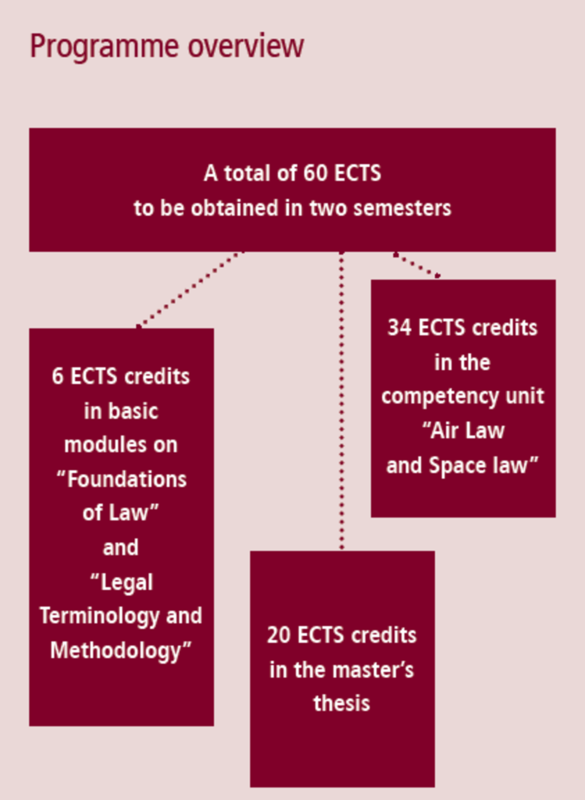 The Faculty of Law confers the degree of "Master of Laws" (LL.M.) after passing the Master's degree. The course can be taken both in the winter and summer semesters. To whom is the progamme adressed? 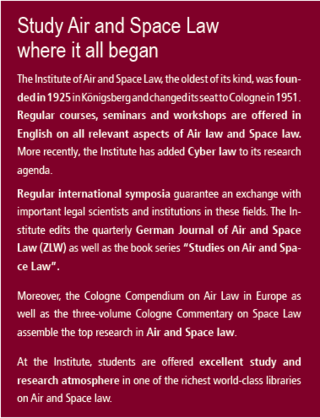 To lawyers who have obtained their legal degree abroad and are interested in postgraduate studies in public, international and European law with a focus on aviation and space law, as well as to lawyers interested in pursuing a Ph.D. in this field. For the LL.M. programme no tuition fees are payable. There is currently a social insurance contribution of around € 260.00 per semester. In return, every student receives a "semester ticket" which they can use to travel freely on all regional public transport (bus, underground, regional trains) in North Rhine-Westphalia for the entire semester (6 months). You can find further information here. 3 credits in the compulsory module "Foundations of the Law"
3 credits in the compulsory module "Legal Terminology, Methodology and Vocational Competency"
34 Credits in the Competency Unit "Air and Space Law"
Examination Regulations for the Master's degree course "Law for Foreign Law Graduates"